Seventeen years after his death, Bill Hicks has taken a permanent place in the cultural landscape and is widely recognized as one of the greatest American comedians of the modern era. Described as many things – philosopher, social satirist, even preacher – Hicks was ultimately a performer who, for many, changed what comedy could be. He believed that comedy played a vital role in any free and just society, and that the comedian, a free spirit detached from political or corporate agendas, was able to voice what others wouldn't, challenging convention and presenting ideas that would stimulate the minds of the audiences. Hicks had no difficulty making people laugh- but what he really wanted to do was make them think. His comedy savaged the injustices of life in the late eighties/early nineties hangover that was post-Reagan America. But his uncompromising approach was met with controversy and resistance at home, and he found fame on the international stage instead. In 1993, on the verge of finally breaking through to the elusive mainstream American audience, Hicks was diagnosed with aggressive terminal cancer, and his life and career were cut short at the age of 32. But his timeless material lives on, revered today by both comedians (who frequently cite him as an influence) and fans alike. 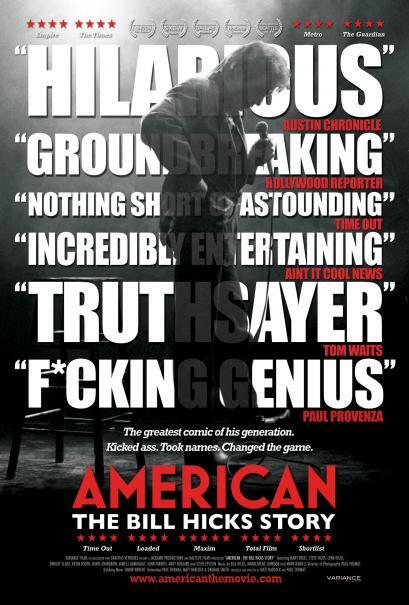 Bill Hicks' remarkable journey is brought to life in the documentary feature "American: The Bill Hicks Story." 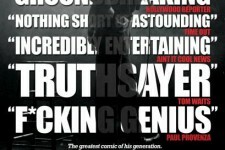 Combining revealing new interviews from those who knew him best with a bold new photographic animation technique, "American" eschews "talking heads" and takes the audience inside Hicks' unfolding life story using archival footage and animated photographs, many from Hicks' personal collection and previously unseen. It's a film that innovates, inspires, and outrages - while being funny as hell in the process.